October 10, 2006  "The Old Veterans"
The big news the past three days is that our Sherpa team has pulled off big carries to stock the South Col for our final summit push. On October 8th, the guys carried huge loads all the way to the Col from Camp II in ideal conditions  almost no wind. The only problem they encountered was deep snow after the Geneva Spur, on the relatively flat section that leads into the Col.
Today, they repeated the same carry, but it was much windier. When Dasona reported to me by radio from Camp II, he sounded tired. But they got the job done. One great story about these carries to the Col is what happened on October 7th. 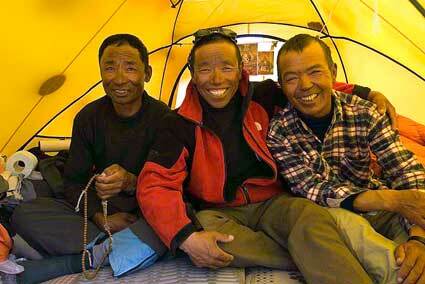 Ang Nima, “the Icefall Doctor and Aarita, two of our “Old Sherpa Veterans” did a carry to the Col by themselves. As you know Ang Nima is working directly for our expedition this year. He first worked for me on an Everest expedition in 1989, long before he became an icefall specialist. But those days are long gone, and now, at age 56 he has become a master of the lower mountain. He has not been high in many years  at least 15 by my guess. So when Ang Nima first asked me several weeks ago if he could carry to the Col, I looked in his eye to make sure he was serious. Clearly he was into the challenge. I told him we would see, but I have to admit, I was very taken with the idea of my old friend returning to the South Col. Then on the 6th, Ang Nima called me by radio from Camp I. He had just supervised the reworking of a bad section of the “popcorn” area of the Icefall, and felt that his icefall route was again in good order. When I heard the next day that Aarita, age 47, who still does the South Col carries regularly (usually with the biggest loads) and Ang Nima were climbing through the yellow band early in the morning, I knew they would go all the way. They did and we were very proud for them when they returned to Camp II in the afternoon. Now Ang Nima must return to his role of supervisor of the Icefall. But a highlight of all my Everest years will be remembering the day that the Icefall Doctor made a return climb 8000 meters to the South Col of Everest (26,250 feet).